and North County residents may find themselves without power Monday or Tuesday. sustains his horses and other livestock as well as his family. 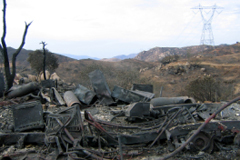 to fight fires,” Root told East County Magazine. to run medical equipment such as respirators. power goes off,” he concluded. expertise to assist homeowners in installing generators. Road in San Diego regarding the October 2007 San Diego area fires. to pass on liability to CPUC. high-resolution cameras to inspect transmission lines. residents complained before the fires that some lines were improperly maintained. People with medical needs, such as respirators, who can't afford generators should call 1-800-411-SDGE. "We will help them to the best ability that we can," said Bolduc. "We have numerous programs in place for low income customers. We definitely want to make sure that they have a safety plan in place. That applies to people with livestock, too, although they are not necessarily considered critical customers." All County residents should have a safety plan in place to protect themselves, their families and animals in the event of a power outage, Bolduc added. foods, operate medical equipment and businesses during a prolonged outage. receive advance warnings of shut-offs, when time permits such warnings. or via portable devices such as Blackberry units. Education is not a getaway to success but rather generally only a door for people to be publicly insured so they can save themselves by devouring a degree. Through the rush my essay you can get good marks in your class room and learnt lots of thing in your life. 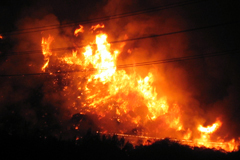 Will it not endanger residents if the power is up during fire? These comments from Vista's Fire Chief were forwarded to me this evening, raising disturbing questions about just how well SDG&E thought out its shutoff plans. Apparently it didn't bother to consult with fire stations first! I learned yesterday SDG&E will be implementing a plan, effective October 1, 2008, where they will deenergize certain power grids across the county during times of red flag warnings for about 2-5 hours during the day. These areas involve extreme and very high fire hazard areas and include fire stations #2 and #3. They are saying it will affect some 6000 homes. The County Fire Chiefs have expressed extreme disagreement with this plan, but to no avail. Our concerns include folks on ventilators, oxygen machines, etc that will be adversely impacted. We asked about some kind of public informational campaigns, but to date little has been done. SDG&E is saying they will be rolling out an educational campaign, but with one week to go it could get very interesting for us and our citizens. We may want to put something on the web site regarding this. Also, this may be something the cities and districts may want to weigh in on. For the fire department, we need to be sure our generators are up to par. Let me know if you have any questions. More as I have it.